How much of utopian thinking is an attempt to re-create, or re-imagine, the family? Quite a lot of it, if Commune is anything to go by. Jonathan Berman’s documentary tells the story of a group of hippies and anti-war radicals who banded together in 1968 to buy Black Bear Ranch in wild and woody Siskiyou County, California, for an experiment in alternative living. Impecunious themselves, they raised the purchase price of $22,000, as Michael Tierra, one of the now-middle-aged founding fathers tells it, by going to the Doors, the Monkees and other popular entertainers and telling them that they were "making money off our lifestyle" and that it was time for them to give something back. It tells you all you need to know about the Sixties that this ploy actually worked — and that when the original settlers at Black Bear Ranch invited others to join them, their slogan was "Free Land for Free People." As the press materials tell the tale, "soon the fragile bonds of human connection became frayed, especially when the group discovered that each person had a totally different idea of what utopia might look like. . . and that ‘free love’ wasn’t free after all." Moreover, as hundreds of people passed through the commune, "life would be complicated by growing conflicts about the role of women, child-rearing, proper communalist behavior, the FBI, and most traumatically, a child-snatching cult." All this may be true, but we don’t really see it happening in the film itself. There are some references to sexual tensions and jealousy, owing to the commune rule that no one could sleep with the same person for more than two nights in a row, lest they should find themselves becoming a couple. Couples were thought to be bourgeois. But that’s about as far as the "conflict" extends. The FBI is treated as a joke. Even the "child-snatching cult" — something called the Shiva Lila, led by a guru called Gridley Wright — is said in the film to be merely "child-worshiping" and seems to have gone quietly when asked by the others to leave. I may have missed something, but it sounded to me, too, as if the one of the commune’s children, Tesilya Hanauer, who went off with them when they did, did so of her own free will. The point is that the commune resembled a family in nothing so much as in the readiness of its members, looking back, to forget the bad things and remember the good. All is bathed in a nostalgic glow with which the film is regrettably unwilling to interfere. It may have set out to give us "a revealing look at how our most basic choices about family, work, and relationship can send powerful and lasting shock waves through the fabric of communities, nations, and the world," but it does nothing of the kind. For apart from some archival footage of the anti-war demonstrations at the Democratic convention in Chicago in 1968, which was not the consequence but (to some extent) the cause of the Black Bear commune, the existence of communities, nations and the world outside the commune is ignored by the film. 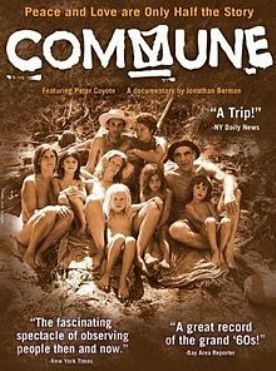 The only people in it who are not in some way a part of the commune family are a couple of good old boys called Mel and Hoss who were the hippies’ neighbors up in the woods of Siskiyou County and who profess themselves to have been shocked, nearly 40 years ago, when the commune moved in. "A lot of times they didn’t dress," says Mel. Sure enough, there are a number of shots of naked hippies that they must have taken of themselves over the years, perhaps as a way of recording for posterity the revolutionary activity that might otherwise have gone unnoticed by anyone apart from Mel and Hoss. I, for one, would like to have seen a lot more of those two, or indeed of anyone else outside the Black Bear community itself, who could have provided a bit of perspective, both on the revolutionary ideas of 1968 and on the attitudes of the communards as they have evolved over the decades since. Instead we have a bunch of middle-aged people trying to make sense of their lives more or less as all middle-aged people do, but with a certain defensiveness about the commune days which, so far as we can tell, all of the original members have moved on from, though they still occasionally foregather back at Black Bear Ranch for family reunions. The only dissenting voice comes from Aaron Marley, son of Richard and Elsa Marley who were among the first founders of the commune. Now a biochemist and living a normal, "bourgeois" life, he tells us that he rebelled in childhood. "I decided I wanted to be like the logger kids," he says, so he got himself a crewcut and went to live off the commune with an Indian woman called Rachel. Looking back, he thinks that he and the other kids "were like lab rats: experimental tools for their parents." He says now has a good relationship with his father, but "I keep my distance a little." This bit was obviously recorded before it was found that Richard was dying, and his funeral provides a natural ending for the story of Black Bear Ranch Commune, which has now been deeded to a trust made up of everyone who has ever spent a winter there. But to me the last word belongs to a former member of the Shiva Lila who says to the camera: "Wanting to save the world can be a huge ego trip." This film is the proof of it.